Dream: Abby and I are sitting on the roof of our RV, looking north for some reason (maybe trying to see the sunset, which isn’t to the north.) Someone behind us shouts, “Look!” and we look around to see that to the northeast there appears to be a slowly-growing mushroom cloud of differing colors. As the blast wave approaches, it occurs to us that we should get inside before it arrives. We go to the garage and hide until it blows past. Later, we emerge to find the mushroom cloud has very slowly grown into a spectacular sunset, covering what looks like about three states. As I hunt for a camera, someone tells me that the event was some kind of accident in Moore, Oklahoma (which I am aware is to our northwest.) I continue to look for a camera, and when I find one, I continue to look for a vantage point. By the time I find my vantage point, night has fallen and I have missed the shot. 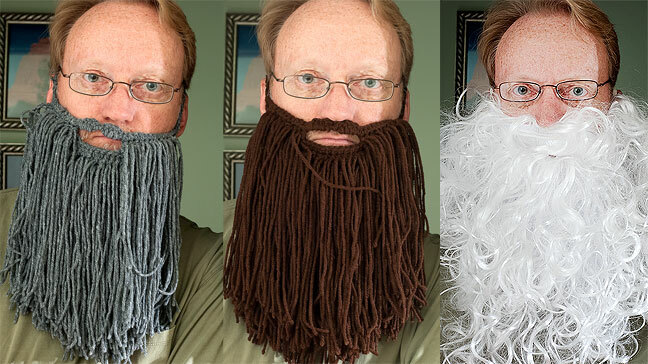 As it happens, my wife crocheted two beards for a coworker’s child’s birthday party, so I tried them on for her. The white beard is a Santa beard. A plane crashes into your house…no camera. Mushroom cloud? Again, no camera. Photog’s nightmare!